We all are well aware of drones and their multiple functions. But have you heard about a drone that can dig the hole in a perfect place? This drone verify first its spot that is diggable or not and then dig the hole and fly away. 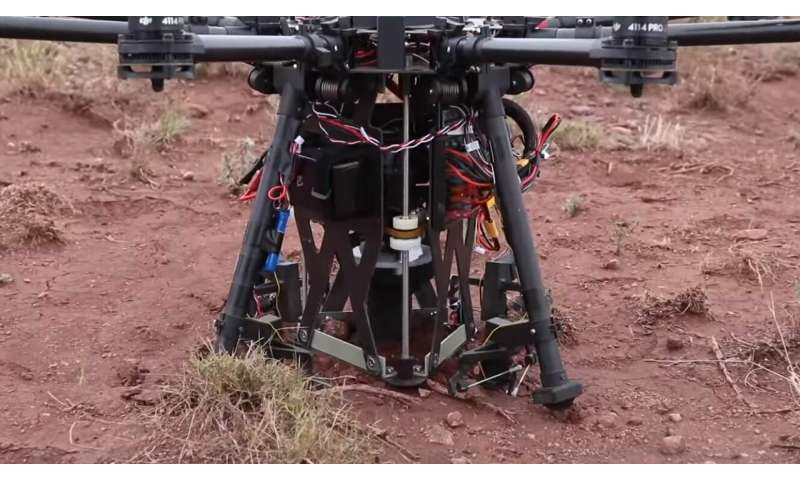 This digging drone has researched by University of Nebraska—Lincoln (UNL). It is an assembling of 2 drones and a parachute. This drone keep a useful distance to locate the spot that is diggable or notspot that is diggable, landing, then verifying that the spot really is diggable. Then it will dig the hole very smoothly with no human efforts put the sensor and fly off. But why we need this Digging drone? Human can’t sense the perfect place where they should dig to accomplish their particular task. We even does not know about the whole can be dug. With this done we can dig a hole, burrowing into dirt, sand, or clay, as it is equipped with a drill. Once it is finished it lifts and flies away. This drone is made to sense the particular area where human can’t capable to take a control. The system starts on a plane or helicopter, which ejects the entire thing inside of a cylindrical canister. The canister falls for a while, then slows down with a parachute. Once it’s close enough to the ground it pops out, lands and drills a massive hole with a screw drill and leaves the heavy parts to fly home. For solving this problem the NIMBUS Lab came up with a Helicopter and a Parachute and one of the most effective drone capability. This is made to save the energy which is needed in the return journey of the drone. Where this drone is used or what are its applications? It is widely used in the military applications where we need to dig the sensors into the ground both to secure the sensors so they don’t get washed away. To sense the area for mining. To place sensors such as soil moisture sensors that need good contact below the surface. to place sensors n sensitive wetlands environments, which are often hard to access in other ways without impacting the environment. All about tyres,what is the meaning of numbers on the Tyre? What is inside the Tyre? How are bridge columns built underwater?